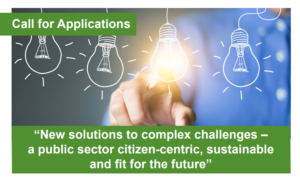 The European Public Sector Award 2019 aims to reward creative solutions in public administrations that show how the public sector is responding to major challenges. All European public sector entities from all administrative levels, as well as public sector enterprises and agencies, are eligible to submit their projects for the award. The award is organised by the European Institute on Public Administration (EIPA) and supported by several European countries, as well as the European Commission’s Structural Reform Support Service. Introduce innovative solutions that rely more closely on citizen engagement and on partnerships with the private or non-profit sector for better public service delivery. Category 1: Projects/cases submitted by organisations from the European or National level. Category 2: Projects/cases submitted by organisations from the Regional level. Category 3: Projects/cases submitted by organisations from the Supra-Local or Local level. The lead applicant is a public sector entity. European geographical origin of the applicant. Relevance to the theme of EPSA 2019. The application/project /case must have been in operation long enough to have proven evidence of impact and a tangible result. Application form completed in English. Confirmation that the application has been submitted, i.e. notification mail before the deadline of 24.00 Central European Time (CET), 18 April 2019.